I participated in an Influencer Program on behalf of Mom Central Consulting for OshKosh B’gosh. I received a gift card to facilitate my shopping trip and to thank me for participating. 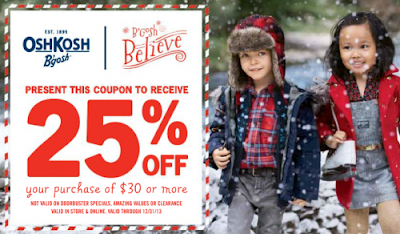 The brand that's so much fun to say - OshKosh B'gosh - is bringing back old memories just in time for the holidays. My mother decked us out in OshKosh B'gosh when my brother and I were little. She loves shopping for my kiddos here and outfitted Kenzie with many of their iconic overalls when she was a toddler. Now that I have littles of my own, I love to shop here (on occasions when we hit the outlets) for my own as well as pick up gift items for my friends. The store is always appealing and the selection is vast. I previewed the holiday catalog online before heading to the store and had a few things in mind already. I was pondering upon a snowsuit for Kenzie for when we take her up to the mountains for her first snow angel building experience. 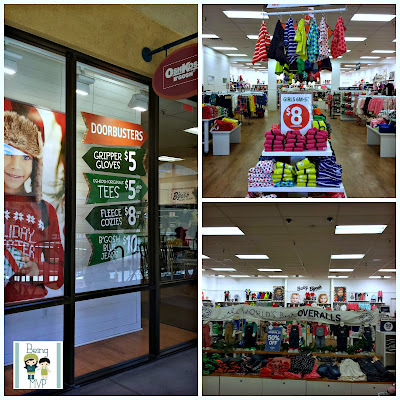 But when I reached the OshKosh B'gosh store, I couldn't contain myself. There were so many fantastic doorbusters in addition to the regular amazing sale so I decided I would pick up the snowsuit later when we make trip plans. 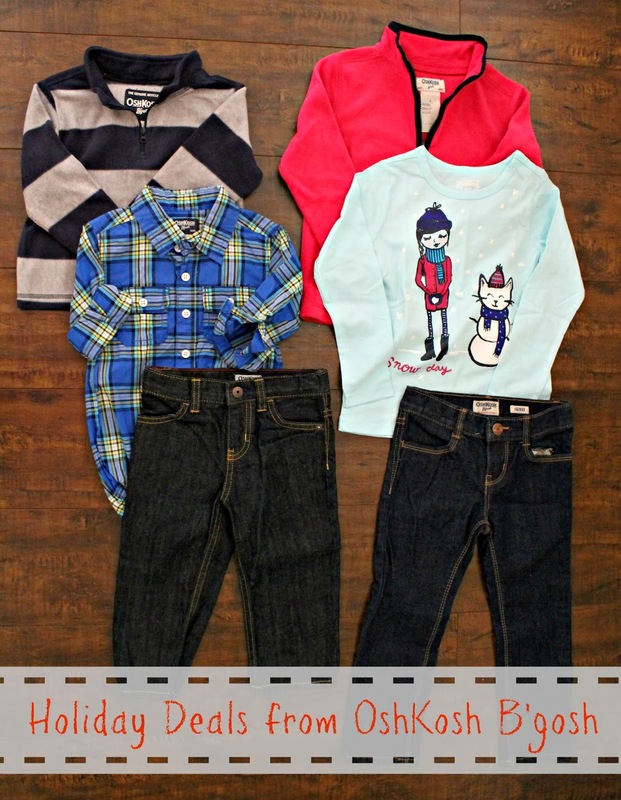 Since the holidays are approaching, I wanted to find outfits for my children that were photo perfect yet play ready. I decided on creating simple looks with classic denim as the base. The plaid bodysuit with denim jeans (doorbuster deal for just $10) is a great look for Mason because he looks just like daddy! Just added the precious trapper hat and he is ready to hit the town (or playground). We also picked up the doorbuster fleece pullover for just $8! These are super light and thin but are very warm. I pondered over the red stripe overalls and will be ordering them soon online as they didn't have his size in store. Kenzie picked up a pair of the $10 skinny jeans as well as a couple $5 doorbuster long sleeve tees. I also saw a comfortable pair of stretch jeggings that Kenzie needed that were only $12. She also scored a nice microfleece jacket at the doorbuster price of $9. I do have to admit that when I went to the store on a holiday weekend, the size selection was a bit sparse (for my kiddos' sizes) so I had to change my plan of attack from my original online shopping preview. However, I think we made out really well as you can purchase quality pieces at a superfabulous deal. Kenzie even found a neon link bracelet for just $1! Print out this OshKosh B'gosh 25% off $30 coupon to use at the store near you or online. Iconic brand, amazing prizes and fantastic quality. What more could you want to style your little mini me this holiday season and beyond? 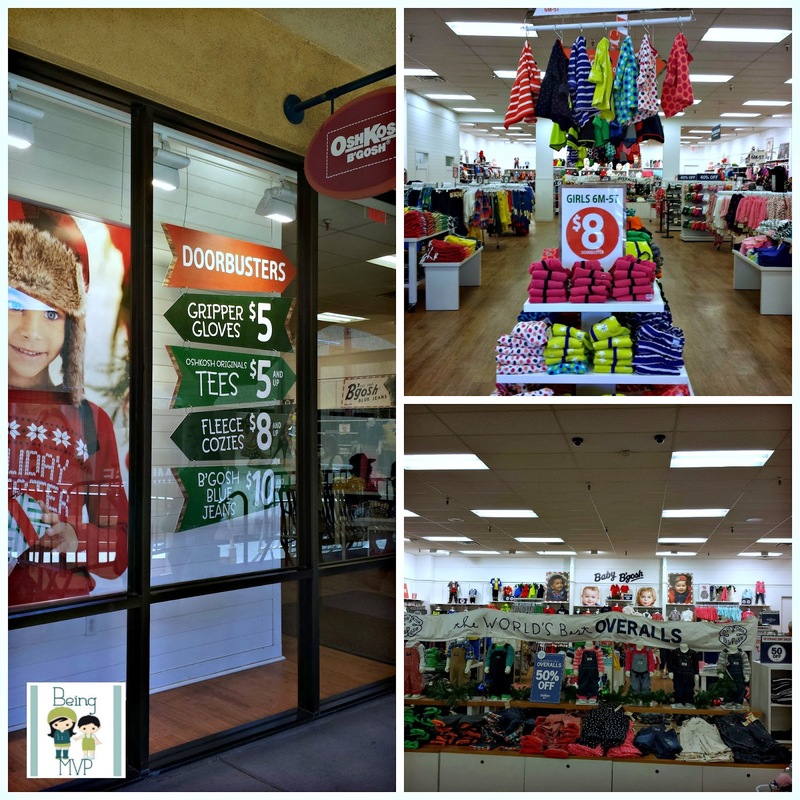 Shop OshKosh B’gosh at oshkosh.com, and connect on Facebook, Instagram, Pinterest, and Twitter. 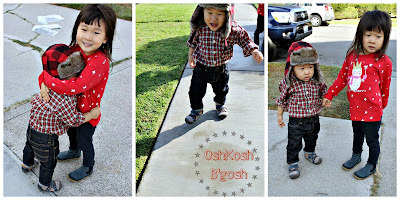 Osh Kosh clothes are so cute and I have been very impressed with the quality. Nothing lasts longer than OshKosh clothes!!! They have the cutest holidays clothes! Oshkosh clothing is always the cutest! I love their designs and I love the price!